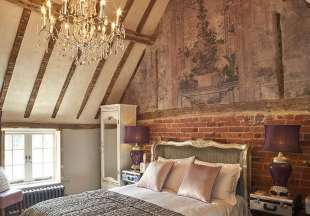 In the heart of Old Amersham, this 15th century, carefully refurbished hotel offers 34 rooms blending modern comforts with original features. The Kings Arms also boasts a cosy bar and bistro, and featured in 'Four Weddings and a Funeral'. This 300-year-old inn has been sympathetically and stylishly designed, retaining lots of historic features and character whilst offering all modern comforts. 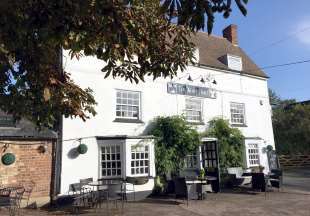 Situated on the outskirts of Aylesbury, the inn offers boutique en-suite rooms, restaurant, bar, lovely garden and free parking. 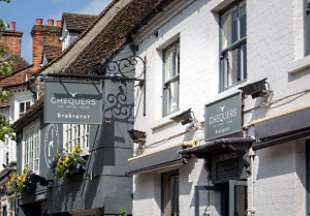 The award-winning 15th century Nags Head Inn is situated in the Chiltern Hills just 10 minutes walk from Great Missenden and the Roald Dahl museum. 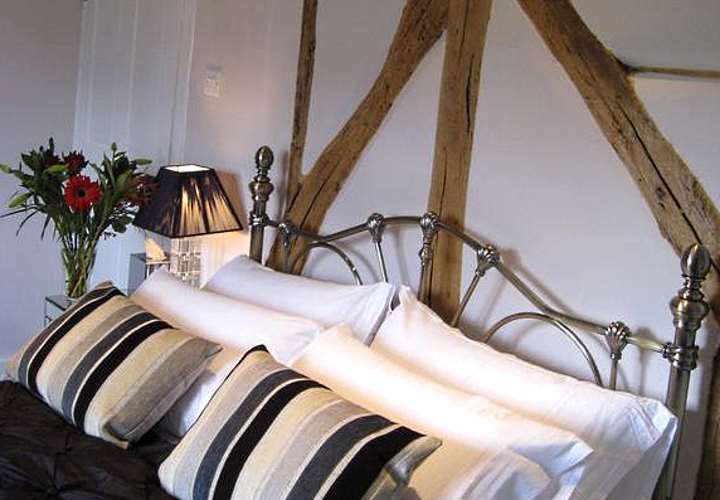 This AA 4 Star Inn offers contemporary styled interiors and Anglo-French fusion cuisine. There is a large, pretty garden for al fresco drinking and dining. This Grade II listed, 14th century Inn has been providing superb hospitality to travellers and villagers alike for hundreds of years. The atmospheric bar with cosy log fires, flagstone floor and real ales is ideal for meeting friends, pre-dinner drinks or watching sporting events. Our restaurant specialises in fresh English and continental dishes offering an innovative menu. 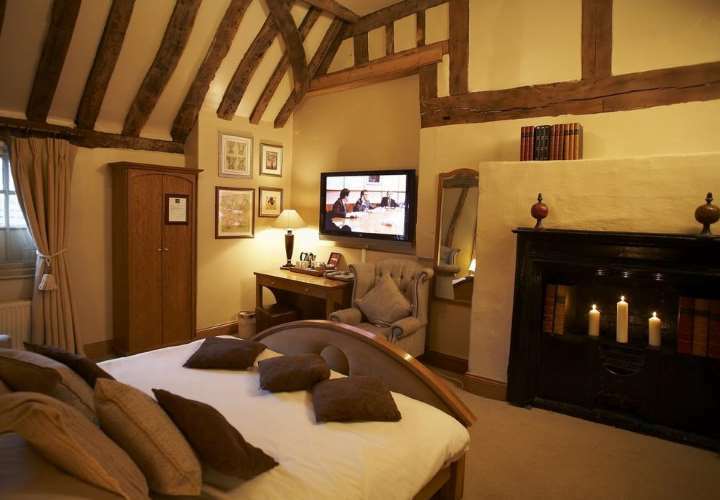 Many of the rooms have exposed beams or fireplaces and all have free Wi-Fi and luxury private bathroom. Set beside the River Misbourne, we are 5 minutes from the M40 Junction 1, and 30 minutes from London by train. 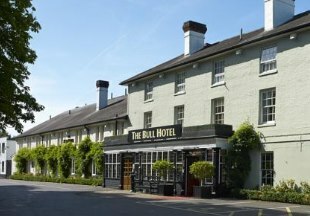 Dating back to 1688, The Bull Hotel overlooks the village common, just 2 miles from the M40 and one mile from Gerrards Cross Station. The hotel's modern restaurant is open every day and serves a full English breakfast and a modern European evening menu. Local beers and light lunches are available in the Jack Shrimpton Bar, which features a log fire. Legoland, Windsor Castle, Blenheim Palace and Hampton Court are among the attractions in this part of Buckinghamshire. This classic 400 year old country house hotel boasts an idyllic location on the banks of the River Thames overlooking Marlow Weir. It offers an oak-panelled cocktail bar, two award-winning restaurants and sumptuous bedrooms, some with river views. Boat trips and picnics on the river are available, as well as fishing on the Thames. 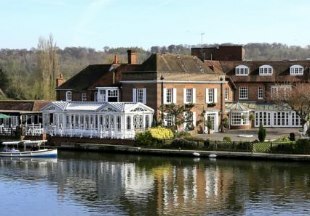 The hotel is perfectly placed for Henley Regatta, Marlow Regatta, Swan Upping and exploring the attractions of Buckinghamshire. Welcome to the 16th century Chequers at Marlow. 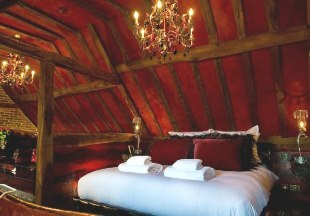 Situated on the High Street, the inn offers nine stylish en-suite rooms, bar with original beams and dining room. The oldest building in Beaconsfield, The Crazy Bear oozes luxury and flamboyance. Individually designed bedrooms boast copper baths that fill from the ceiling and touch-activated mood lighting. There is a choice of dining with three restaurants: English, Thai and Italian. An outdoor swimming pool and spa bath complete the hotel. The Crazy Bear is only 2 minutes’ drive from Junction 2 of the M40. Guests can book free parking at the hotel. This historic 18th century village inn is situated just 8 miles from Milton Keynes and offers four en-suite guest bedrooms, quietly located in a converted barn across from the main inn. 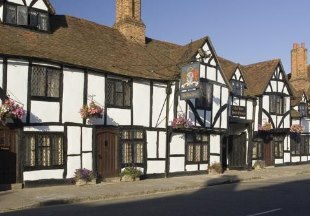 A traditional 16th century coaching inn, The Red Lion is situated on the High Street in Wendover, Buckinghamshire. Steeped in history, the hotel successfully combines original features with a contemporary look and feel. 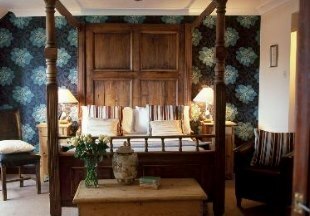 The inn offers 23 en-suite bedrooms, dining room and bar, restaurant, free Wi-Fi, and free on-site parking. Less than an hour by train from London, the Red Lion is the perfect location for a weekend away. Welcome to Buckinghamshire and our carefully selected listing of hotels and inns in Buckinghamshire. Located just outside London, Buckinghamshire is a mix of the urban and the rural. Surprisingly, Buckingham is not the country town but Aylesbury, famous for its ducks! One of the best known towns in Buckinghamshire is the 'new town' of Milton Keynes, famous for its concrete cows and shopping centre. To the south of the county you will find High Wycombe, Marlow, Beaconsfield and historic Amersham. The pretty Chiltern Hills run through the Buckinghamshire countryside as does the historic Ridgeway, a very popular route for walkers. The Buckinghamshire countryside is dotted with great pubs and inns, many dating back centuries to the old coaching days. 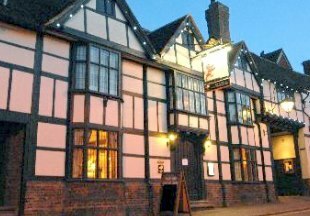 You can easily identify an ancient coaching inn (such as the Red Lion at Wendover) as it will most likely have a domed entrance wide enough (and high enough) for carriages to past under. This entrance leads to the stables where the horses would be fed and watered overnight. Today many of these stable blocks have been converted to provide comfortable accommodation. Stay in a traditional coaching inn in Buckinghamshire and you can easily imagine what it must have been like to travel by coach all those centuries ago! "Buckinghamshire is Roald Dahl country. The famous children's author made his home at Great Missenden, and the 15th century Nags Head Inn there was his local. A perfect blend of original features and contemporary style, the inn boasts award winning food and is just a short walk from the Roald Dahl Museum." Buckinghamshire is bordered by London, Berkshire, Oxfordshire, Northamptonshire, Bedfordshire and Hertfordshire. If you want to widen your search, why not browse through our selection of hotels and inns in London, Berkshire, Oxfordshire, Northamptonshire, Bedfordshire and hotels in Hertfordshire.